This week, I am arriving in Springfield to conclude the 100th General Assembly and participate in the Inauguration ceremony to commence the new 101stGeneral Assembly. I am looking forward to working together with my colleagues to tackle the immense challenges that we all face here in Illinois. I am hopeful for good faith discussions and a willingness to make the tough decisions that lay ahead of this session. Below is my perspective on this ceremonial transition week and some top policy priorities that I am hoping to get accomplished as we start the New Year. Lame Duck sessions make me nervous because they are generally associated with bad policy that the Speaker wants to ram through the chamber, by members who can take bad votes because they will not be there when the new General Assembly is sworn in on Wednesday. The fall veto session taught me a great deal about the legislative process under Speaker Madigan. Among other things, I’ve learned that the Speaker likes to keep our caucus in the dark on issues that will be called up for a vote until the last minute, so we have little time to adjust or strategize. With the sheer volume of pending bills that can be called, it is next to impossible to fully prepare for every bill that could be up for a vote. This holds true for the Monday and Tuesday Lame Duck session, however instead of being frustrated, I choose to view this parliamentary gamesmanship as a challenge. Despite the speed and intensity of my first legislative session during Veto week, I kept my head above water and I feel I did a good job making decisions and representing the 104th district on some important votes. I am very excited for Wednesday and the beginning of the 101st General Assembly. My time since the end of veto session has been spent prepping for the new session, meeting with area leaders for ideas, and molding those ideas into a legislative agenda that will be beneficial to the 104th District. I’ve had the pleasure of meeting with municipal leaders around the district, County Officials, education professionals, and many others. Among other things, we’ve talked about economic development, agriculture, and two of my campaign priorities: Education and Infrastructure. Through these productive discussions, we have developed a practical plan for legislation in the new GA. The first bill I intend to file is an important measure that Representative Hays pushed in his last term. It is an adjustment to the property tax code, which would allow agricultural buildings that have been destroyed in a natural disaster to be rebuilt without penalizing the owner with a large jump in their property tax assessment that would prohibit the reconstruction of the lost building. This allows for the owner to better manage the extra cost associated with rebuilding after a catastrophe and for tax increases associated with rebuilds to be implemented over a manageable time frame. The credit for this measure belongs completely to Rep. Hays, and I hope to get his measure across the finish line. Number two on my legislative agenda is drafting a resolution for the equitable distribution of infrastructure improvements geographically throughout the State. With the swirl of talk about a pending Capital Infrastructure Bill, we need to make sure that the infrastructure projects are equally distributed through the entire State. Downstate has more miles of roads, scarcer local resources, and many great demands. I intend to bring attention to the General Assembly that when the infrastructure funds are distributed, downstate needs its fair share. After working to address local infrastructure needs as Vermillion County Board Chairman and discussing those needs with local officials by holding extensive meetings, one of the largest challenges our communities face is the ability to rebuild and maintain critical public work infrastructure such as water/wastewater and sewer systems. I am very excited to be able to work on this issue because it is something that is completely needed throughout this State. Most communities have old, outdated systems that are starting to have significant problems. Many communities don’t have the capital available or the political ability to raise the revenue needed to address these serious issues. Our legislative staff is working on legislation for me that will propose a water/wastewater funding formula for municipalities. The idea is to encourage upgrades in systems that will keep them safe and viable for the public, encourages efficiency, promotes maintenance investments in the future, and creates systems that are environmentally friendly. The idea would be to assist a village like Catlin to rebuild its sewer system and encourage planning for maintaining the system long into the future, providing means for a Village like Bismarck to finally build a wastewater system, and assisting in government consolidation by joining smaller entities together to create one large regional water/wastewater facility where it makes sense to do so. This would provide the formula for levy consolidation, and thereby relief, environmental stewardship, and work for the health and well-being of our communities no matter what their size. I appreciate everyone’s support, because this has always has been a team effort. My job is to represent you and try to bring our best ideas to fruition. I’m excited about the prospect of accomplishing great ideas and achievements to propel the 104thDistrict forward! I intend to be aggressive as a legislator to stand up for all of us in the 104th, but I will need your help. You are the boots on the ground and will always have the best feel for what changes need to be made to make our government work better and more efficiently. If and when you have ideas for measures that I can push for the 104th, please let me know. We will make a great team together, and use that momentum to make this session a positive one for the residents of Vermilion and Champaign Counties! Thank you all for the opportunity to be your State Representative. 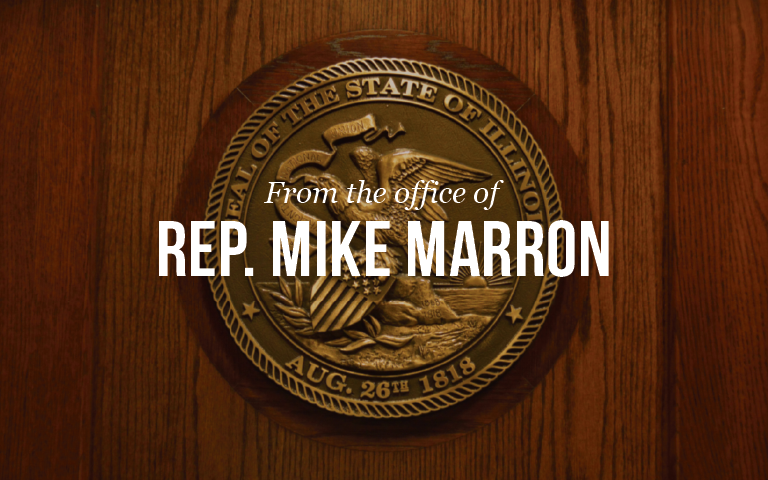 Click here if you have a question or want to be kept in the loop on Rep. Marron’s Legislative process.